Figure 1 from the paper shows LS-MS feature finding in ProMex, a feature detection algorithm that is the first component of the Informed-Proteomics software suite. It was developed to detect isotopomer envelopes of intact protein ions and correctly determine their monoisotopic masses and abundances. Enlarge Image. An estimated 20,300 genes in the human genome encode proteins. The number of proteins themselves, as intact proteoforms, could be as high as one billion. 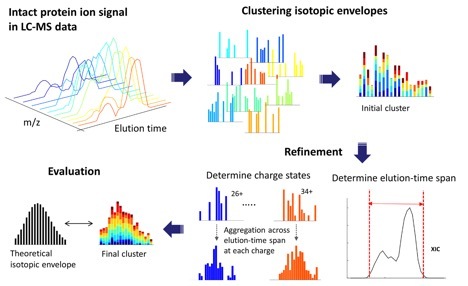 A new Nature Methods paper by lead author Jungkap Park and fellow scientists at the Pacific Northwest National Laboratory (PNNL) introduces Informed-Proteomics, a novel open-source suite of software for identifying intact proteins from mass spectrometry analysis. It contains a full suite of novel software tools for top-down proteomics, which is used to analyze intact proteins. Sponsors: The National Institute of General Medical Science at the National Institutes of Health, the National Cancer Institute Clinical Proteomic Tumor Analysis Consortium, and the National Institute of Allergy and Infectious Diseases. User Facility: EMSL, the Environmental Molecular Sciences Laboratory, a U.S. Department of Energy Office of Science user facility at Pacific Northwest National Laboratory. Research Team: Jungkap Park, Paul D. Piehowski, Christopher Wilkins, Mowei Zhou, Joshua Mendoza, Grant M. Fujimoto, Bryson C. Gibbons, Jared B. Shaw, Yufeng Shen, Anil K. Shukla, Ronald J. Moore, Tao Liu, Vladislav A. Petyuk, Nikola Tolic, Ljiljana Paša-Tolic, Richard D. Smith, Samuel H. Payne, and Sangtae Kim, all of PNNL. Reference: Park J, PD Piehowski, C Wilkins, M Zhou, J Mendoza, GM Fujimoto, BC Gibbons, JB Shaw, Y Shen, AK Shukla, RJ Moore, T Liu, VA Petyuk, N Tolic, L Paša-Tolic, RD Smith, SH Payne, and S Kim. 2017. "Informed-Proteomics: open-source software package for top-down proteomics." Nature Methods. DOI: 10.1038/nmeth.4388.